The Tecra M8-S8011's gunmetal-gray exterior is neutral. It's more interesting-looking than the Lenovo ThinkPad T61 Widescreen, yet it isn't as colorful as the consumer-oriented Dell Inspiron 1420 The Tecra M8-S8011's 4.5-pound frame is made for the road, as well as for those who don't want to sacrifice too much screen real estate. Toshiba's first 13.3-inch business notebook offers good battery life and strong wireless performance for an aggressive price. With the Tecra M8, Toshiba's first 13.3-inch notebook, the company claims to combine affordable mobility with the processor speed, graphics performance, and storage potential typically found in desktop replacements. The aggressively priced notebook features a Santa Rosa processor, 802.11n wireless, and is the first notebook in Toshiba's business line to include a built-in webcam. You won't get blazing performance from this system, which has only 1GB of RAM, but it's a good lightweight productivity partner with very good battery life. As a business notebook, the Tecra M8 tries hard to look stylish. The rounded matte-silver lid contrasts nicely with the black keyboard, but it would look sleeker if Toshiba's name weren't emblazoned across it. 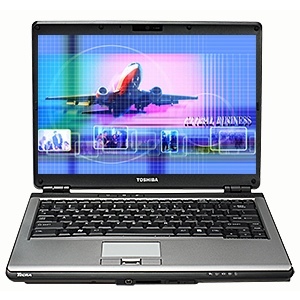 The Toshiba Tecra M8, like the Toshiba Satellite U300/U305 series, is a new 13.3" widescreen business notebook packing solid Intel Core 2 Duo performance in a relatively thin and light form factor. Add to that a thin integrated DVD SuperMulti drive, webcam, and fingerprint reader and this notebook starts looking even better. Toshiba calls the new M8 "a feature-rich fusion of mobility, performance and value" ... but is the M8 worthy of such praise? The Toshiba Tecra M8 is a solid business notebook with plenty of features and few problems. The quality 13.3" glossy display, thin and light lines, sizeable hard drive, good battery life and a good selection of ports help make this an excellent work machine. The Core 2 Duo processor and plenty of available RAM likewise give the system an impressive backbone for performance. In addition, the sturdy keyboard and convenient fingerprint reader interface help users immediately recognize this machine means business. Unfortunately, the obscene overabundance of bloatware is enough to make an IT professional run away screaming. The painful touchpad buttons are also likely to leave users with sore thumbs after a full work day. For many laptop users, finding the right screen size is paramount. While the vast majority of laptops used to fall into the 15-inch category, those are quickly being replaced by more manageable 13- and 14-inch models. Apple's hugely popular MacBook laptops have almost singlehandedly built a market for the 13.3-inch display, which we consider the sweet spot between midsize and ultraportable laptops. On the Windows side, Dell's recent XPS m1330 was a well-received 13-inch system, but it's out of many shoppers' price range. Toshiba's $1,324 Tecra M8 packs the latest Centrino Duo parts, plus extras such as a hard-drive accelerometer, into a 13-inch package that's short on flash but long on value. Toshiba includes an industry-standard, one-year, mail-in parts-and-labor warranty with the Tecra M8, with a $100 option to extend the warranty to three years.